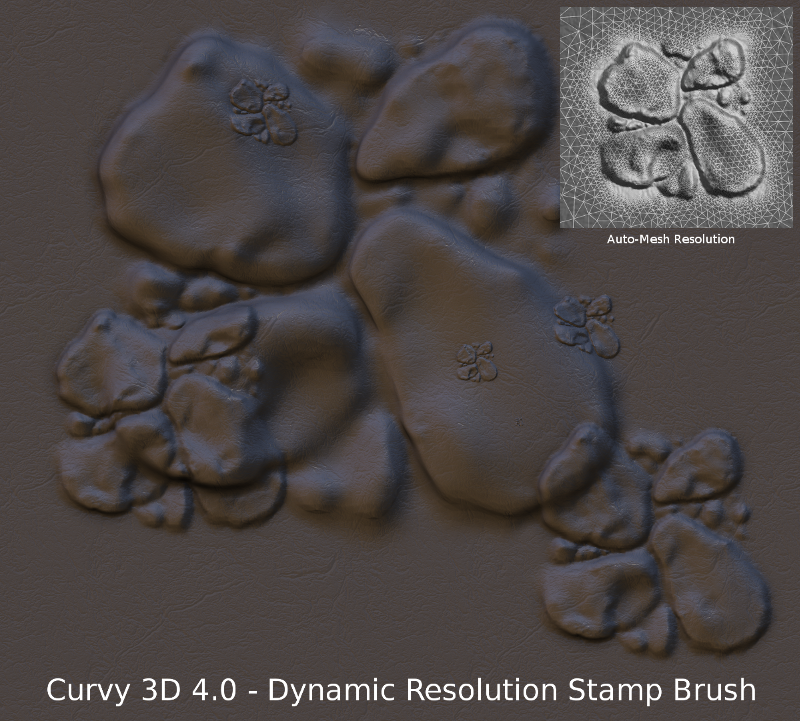 Use an image to emboss or dent the surface as a custom brush shape. The shapes below are CC0 brushes I found online, applied to the Curvy Objects with a few clicks. 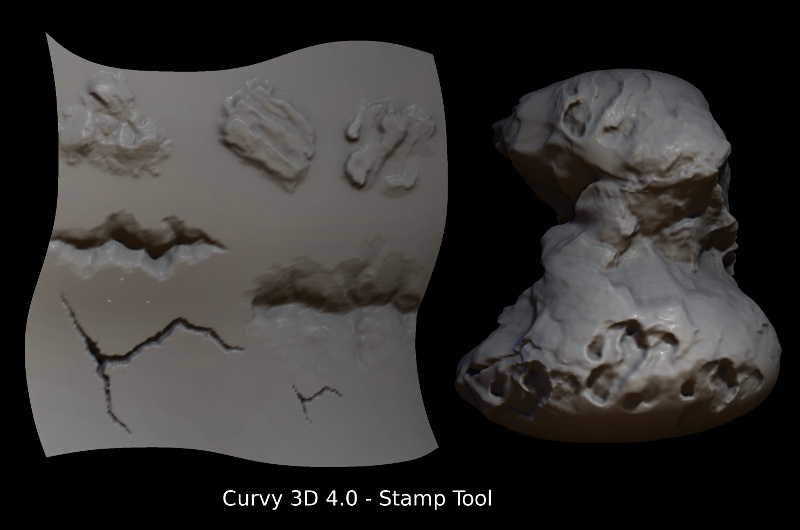 You can also use these with longer strokes for a 'textured' sculpting effect. 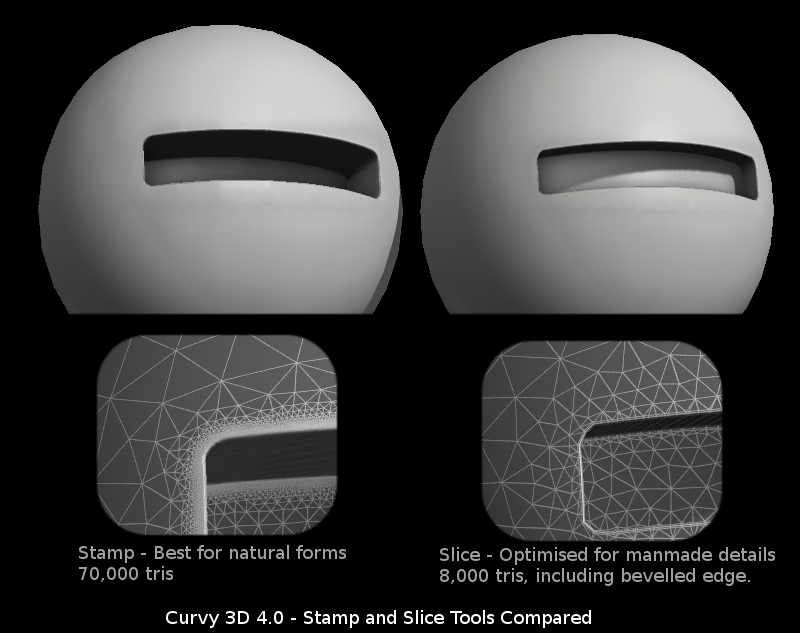 The Stamp tool also works with Curvy's Dynamic Resolution Meshes, letting you sculpt at any scale and keeping the model lighter than using full subdivision. 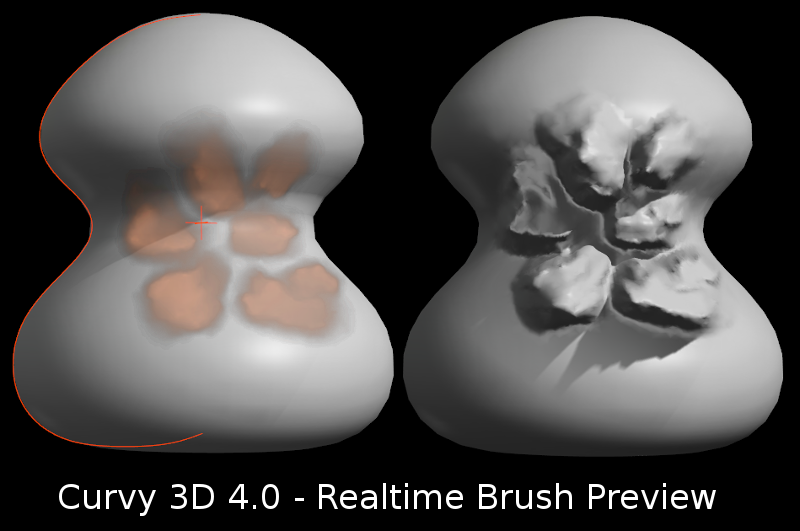 This works very well for fine details like cracks, the highest resolution subdivision is only needed in the sharp details, and the rest of the surface fades into the original resolution smoothly. Here are two brushes to test out the Stamp Tool. The first is a mixture of text and shapes made quickly in a 2D art program. 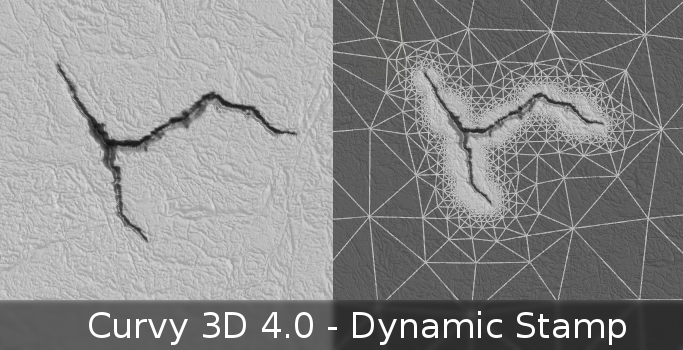 The second is a depth render of a model I had previously made in 3D - now able to be stamped onto another mesh. In practice this is very close to my ideal Curvy Map plans - with dynamic subdivision to make the most of the poly count, and quick application of shapes to make a 3D model. By comparison the beveled cut tools will make a cleaner edge for a 2-colour black and white image - while this Stamp tool is better for greyscale images with more subtlety. As before you can cut as easily as you can add with the Stamp - you can even cut+add at the same time using an offset. 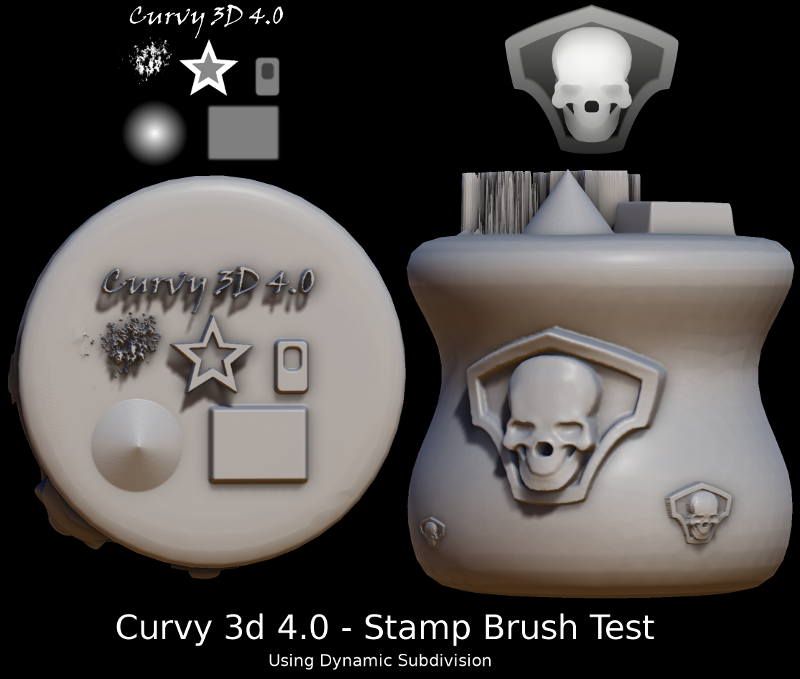 The same Stamp Tool can be used on colour and bump textures, combining a depth stamp with the other texture channels creates a rich effect without needing to add many tris. It is tempting to use the Stamp tool for hard edge detailing, but you don't really huge numbers of triangles to make manmade shapes. I've updated the Slice and Extrude commands to work alongside the Stamp tool, so you can place clean cut bevelled details with the same interface.